Imagine a health care program that is publicly funded and covers all basic medical services from doctor visits, hospitalization, and long-term care to prescription drugs, dental care, and mental health. 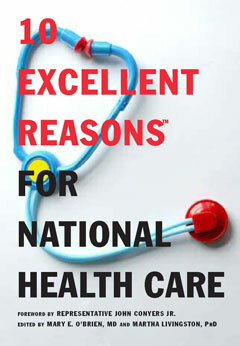 10 Excellent Reasons for National Health Care offers an array of powerful arguments for why and how this could become a reality. With fact-filled chapters written by leading physicians, health care professionals, policy makers, businesspeople, labor organizers, and others, this book shows how a national health care system is simpler, more inclusive, saves money, is good for business, will reduce health care disparities, and is a fundamental human right. In time for the 2008 elections and following on the heels of Michael Moore’s Sicko, 10 Excellent Reasons for National Health Care offers powerful ammunition in favor of a fundamental change to American health care—and shows how we really can develop a comprehensive national health program for the United States.